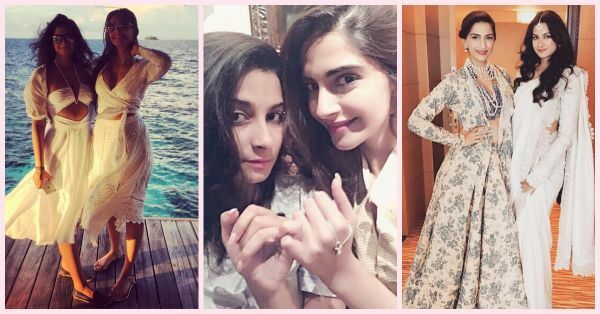 5 Times Sonam & Rhea Made Us Miss Our Sisters! These two celebrities have proven themselves to be rockstars in their chosen fields, and no one can deny that. But that doesn't mean they only give us some serious professional goals. The Kapoor sisters have set some major sibling goals for us too! Here's why and how! 1. Helping out where they can! 2. Bringing in the new year! Sure, everyone brings in the new year with their best friends, but what makes it better is if your sister IS your best friend. 3. Vacation style - on point! On a beach and twinning with your sister! Could there be a better vacation?! We're loving their style and their vibe! 4. Sister over mister, oh YES! No one does shaadi style quite like the Kapoor sisters, and this picture just goes to prove that! Plus that winning #SisterOverMister hashtag, of course! 5. From weddings to Halloween! The most fashionable sisters Bollywood ever saw?! We sure think so! From ethnic wear to Halloween costumes, they can rock it ALL! MUST-READ: So Here’s What Our FAV Celeb Kids Are Up To! MUST-READ: Guess What PC’s First Selfie In 2016 Was?! And Sonam’s? !